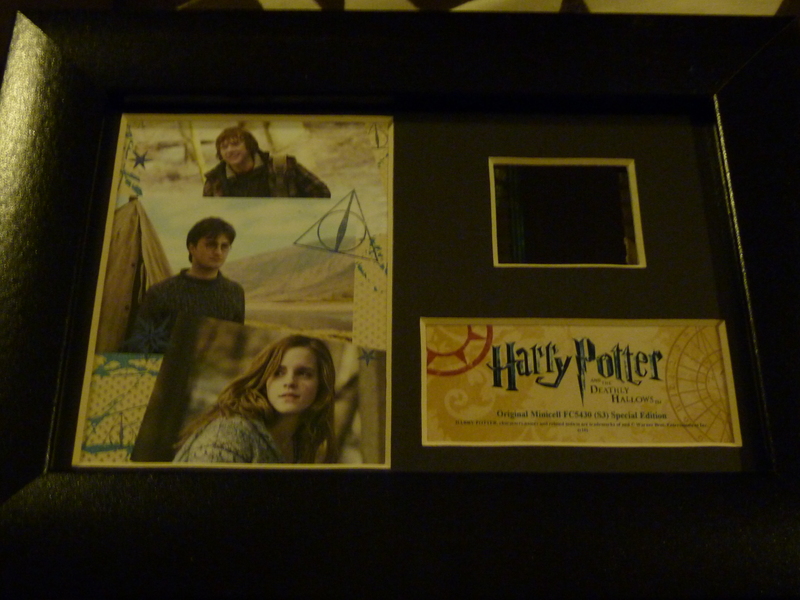 Hi all, this is my first of a series of posts on my visit to ‘The Making of Harry Potter – Warner Brothers Studio Tour’ on 9th April 2012 (and that’s another item off The Bucket List). I’m going to start by being a tease and not telling you anything about the tour itself (don’t worry that is to come but it will take longer to write up). After the tour was over you spill out into the gift shop – and what a gift shop it is. Now, I was hoping to buy an ‘I solemnly swear I am up to no good’ mug but they had been so popular they have sold out. I was informed by one of the lovely staff (more on them in later posts) that they are hoping to have an online shop open by Christmas so I hope to get one then (if not in a repeat visit in August *I am grinning as I type this). So, I just had to buy something else. 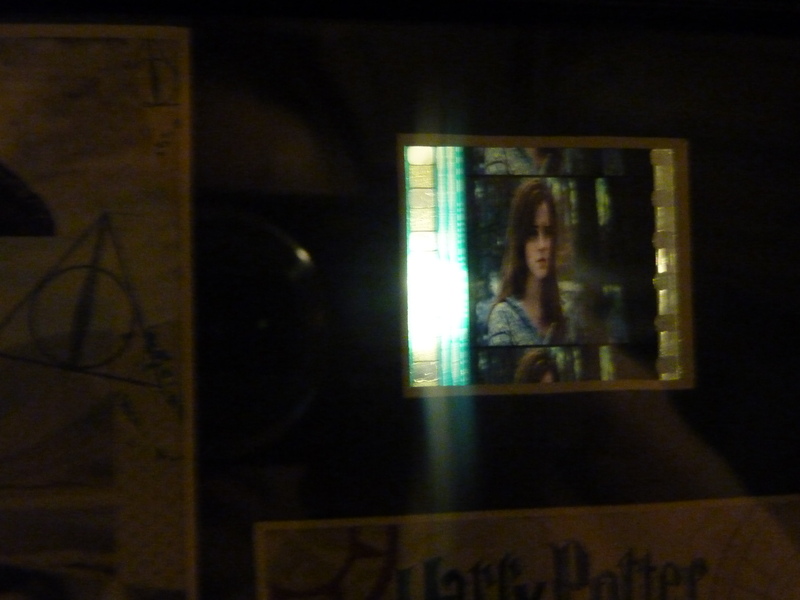 My first item chosen was an authentic 35mm film minicell of Emma Watson from Harry Potter and the Deathly Hallows. I chose it also for the accompanying pictures of the three main cast members. 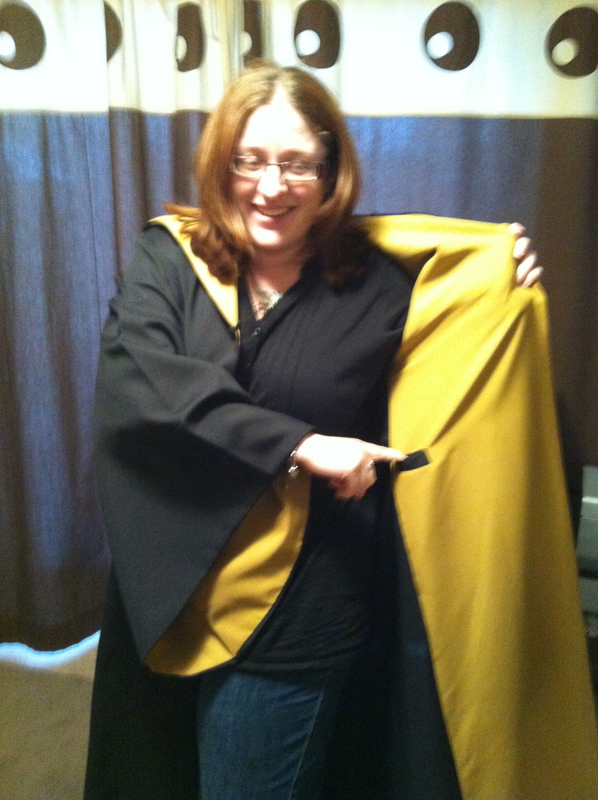 My megageek purchase though was my Hufflepuff robes (Pottermore sorted me into the house of the badger). At £74.95 this was not a throwaway purchase and my sister very calmly asked me when I might wear it. When put on the spot my response was quite feeble with not many options. But now I have had time to think so here, Sissy Poo, is my plan (looks like an evil plan based on the shot below) for robe wearing. 1. When I got home and was chilling and looking at my souvenirs. 2. It was quite comfy so generally around the house (though I have to be careful climbing the stairs). 3. When I return to the studio tour in August (a few days early birthday treat with a fellow Hufflepuff) so I can re-enact my broomstick flying but in house colours. 4. When I eventually go to ‘The Wizarding World of Harry Potter’ in Florida. 5. At a Harry Potter themed party (I may have to throw one myself). 6. At most ‘open themed’ fancy dress parties. 8. At a Harry Potter convention?? 9. At the Quidditch World Cup (it would be so cool to go one year – or play). 10. Potentially for a teaching session?? (Hmmm, I may have to work up to this one). 11. At graduation?? If they forget to order my OT degree robes again and there are no OU robes on standby (now I admit this is unlikely). I could wear under my PhD robes (assuming I complete and pass) and then have a few ‘alternate robes’ pics or I could work towards another OU degree and do as suggested with PhD robes. There is even an OU Children’s Literature course where you can actually study Harry Potter and the Philosopher’s Stone! 14. When reading the extra Harry Potter books, e.g. Tales of Beedle the Bard, the Comic Relief specials etc. 15. When investigating Pottermore (thanks to Stacey for this suggestion of making it a more immersive experience). 16. When playing Harry Potter boardgames (I currently have none but hope to rectify this at some point). 17. When playing Harry Potter games on the Wii. 18. When playing Harry Potter games on the iPhone/iPad. 19. Maybe on my future Harry Potter themed wedding day ;o) (If I can find a potential groom who agrees with this). 20. When being interviewed about ‘my influences’ when I finally get my WIP finished/published. 21. When watching TV and using the magic wand remote control you bought me for Christmas. I think I will stop there but can anyone else think of other situations when this outfit would be required/recommended/appropriate? And the coolest thing about the robe in my humble opinion. The fact that it has an internal wand pocket!!!!! 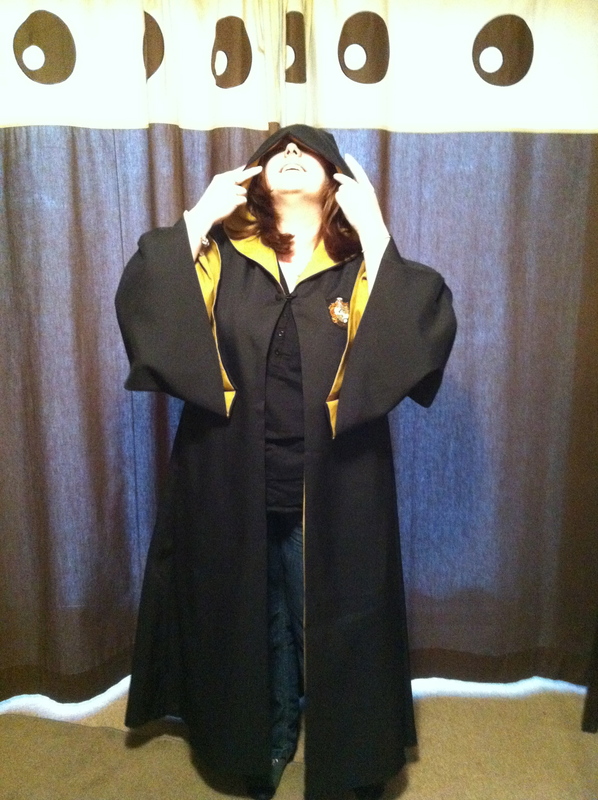 Posted on April 10, 2012, in Bucket List, Kirsty rambles on about life, the universe, tv, and everything!, Reviews, Training Time (WIP) and tagged Harry Potter, The Making of Harry Potter, Warner Brothers Studio Tour. Bookmark the permalink. 9 Comments. *sigh* I’d have thought Cath knew you well enough to knw that once you saw them and wanted them, no amount of ‘where you gonna wear them’ would put you off!! I know. Silly girl (and it is Cas if we are shortening – she is def not a Cath – that’s our buddy). Looking forward to hearing about the rest of the visit. I think they are good quality, was quite impressed because not all of it is. Wow any pics of you in your get up on the blog? I’m looking forward to telling you all about the visit – there may be quite a few posts to come to split it up a bit rather than one huge blurb. Thanks. I think so. Got a few funny looks when I mentioned to people today but I don’t care. Can you believe my sister came back with the comment – only 21!! And told me I would be cheating if I counted the books and the films seperately. Come on guys help me out with the ideas. Although that’s only £3.50 a wear (not £3 – poor earlier maths skills) – think what hire costs would be. Bargain.